Rounded main branches, 1-3 mm diameter, with short, pointed side branches. Tips of branches are flattened and have characteristic“hooks” or tendril-like projections. Length from 3-30 cm. Bright yellow in sun to dark red in shaded areas. Hookweed (Hypnea musciformis) has “hooks” at tips that attach to objects and spread and feels slippery and delicate to the touch. Hawai‘i: O‘ahu, Moloka‘i, and Maui. Worldwide: Mediterranean, Philippines, Indian Ocean, Caribbean to Uruguay. Mechanism of Introduction: Introduced to Kane‘ohe Bay in 1974 for commercial cultivation. Hookweed is a slippery, delicate alga found in calm, shallow subtidal areas. Hookweek is common on calm intertidal and shallow subtidal reef flats, tidepools and on rocky intertidal benches. Most often found on low intertidal to shallow subtidal reef flats, attached to sandy flat rocks. In bloom stage, may be found free-floating. Hookweed washed up on and fouling Maui beaches. Hookweed (Hypnea musciformis) was imported illegally from Florida for aquaculture but abandoned when found to be difficult to process. Within four years it spread around O‘ahu and to Maui, where it forms large, smelly mats on the beaches. Thousands of pounds can wash up on the beach each week, and have caused property values to lower along the invaded coastlines. This species has been collected from all the main Hawaiian Islands except Hawai‘i and Kaho‘olawe. H. musciformis is common on shallow reef flats. It may attach to rocks, but is most often found attached to other algae, especially Sargassum, or floating in large mats. Hookweed is an extremely abundant alga that is commercially cultivated throughout its world distribution as a food source and for its kappa carrageenan. This alga was purposefully introduced to Kane‘ohe Bay in 1974 from Florida for mariculture. This introduced invasive spread quickly, reaching other islands by 1982. The success of this alga in Hawai‘i is likely due to a rapid growth rate, ability to epiphytize (grow on) other algae and easy fragmentation. Drifting fragments reattach to other algae, especially Sargassum, which can become detached during storms and float long distances, carrying the epiphytic Hookweed with it. Dispersal may well have been enhanced by interisland travel with fouled boat hulls. 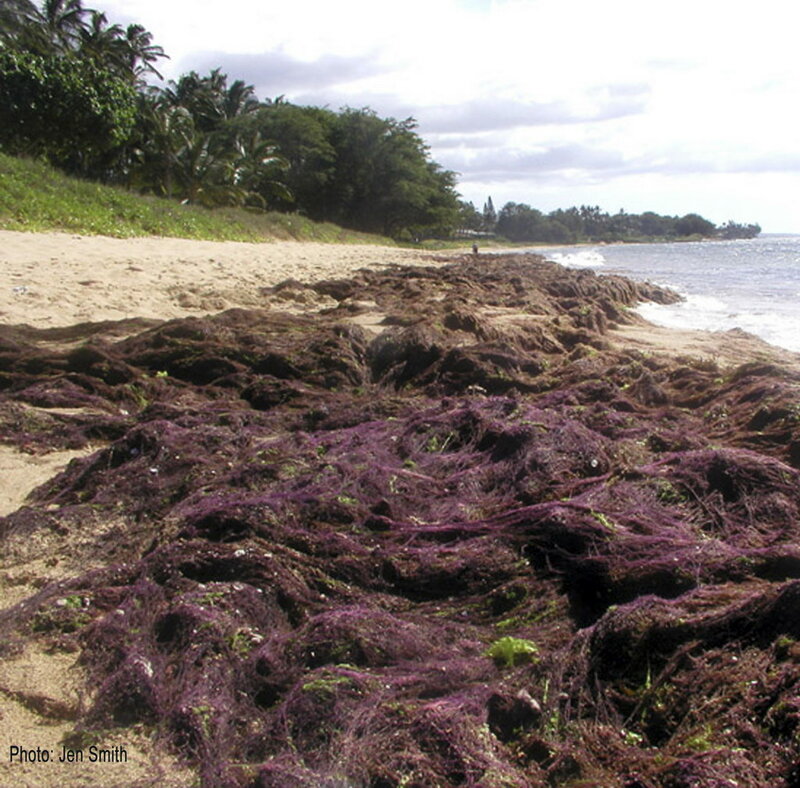 Hookweed is often found in large, nearly unialgal mats, and during the winter can represent 2/3 of the biomass of drift algae on windward and leeward beaches on Maui. These mats are tossed ashore in windrows up to 1.5 feet and are considered an odiferous pest. In peak blooms, thousands of pounds wash up on Maui beaches. Soon after its introduction, it was identified as a food source for the green sea turtle, Chelonia mydas. Hookweed can make up a signficant part the their diet, sometimes representing 99-100% of the seaweed mass found in their stomachs.